Air tightness means cutting out unwanted draughts. 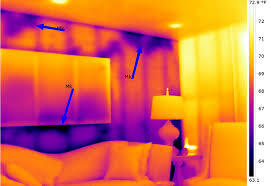 Draughts can be so slight as to be imperceptible, but even slight draughts increase heat loss, sometimes dramatically. The energy consumed by dwellings accounts for a large proportion of Ireland’s total energy consumption. The carbon dioxide emissions from houses contribute to climate change. Much of this energy is accounted for in the space heating. Insulation standards for roofs, walls, windows and floors in the Building Regulations have increased over the years to improve efficiency by reducing heat loss. These standards relate to the average performance of specific elements. As standards improve, the significance of local areas of reduced insulation (thermal bridging). These include: at joints and around the edges of window openings, and gaps in the building envelope. This leads to air leakage becomes increasingly important in terms of contribution to overall heating and ventilation losses from the dwelling. Furthermore the typical additional heat loss due to easily avoidable air leakage is between 5% and 10%. To reduce the impact of these and to address these problems, Insulation Continuity and Air tightness need to be thoroughly considered at all stages of design and construction. More details can be found in this Environment, Heritage and Local Government document.